“I’ve shared my home with CPL dogs in training for 65 weekends, and each one feels like the first time!” Rosemary said with excitement. We were thrilled to have that energy and passion brought into the CPL organization. We now teasingly call Rosemary the “storm” because we all feel her passion and excitement every time she is on campus. 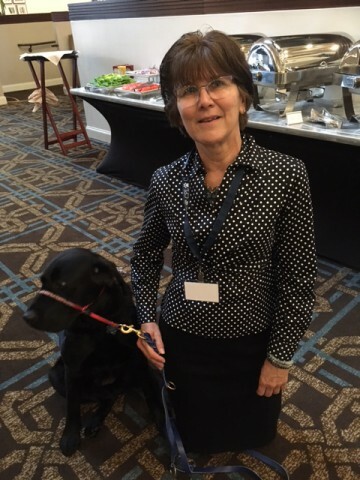 Originally, Rosemary came to CPL looking for a dog-centered volunteer opportunity. She was referred by her friend, Helen, who knew it would be a fun match. But, initially, she informed the Volunteer Coordinator at that time, Mary, that because she lived so far away, she wouldn’t be able to take any dogs home. Mary smiled and said, “just wait and see.” Rosemary still remembers the smirk on Mary’s face as she signed Rosemary up as a Cuddle Time volunteer. And then, sure enough, the inevitable happened! With her son in college, she was a new empty nester. The thought of having dogs was enticing, but having just said goodbye to their beloved pet… it was tough. Enter Cleo – the first dog to spend a weekend with Rosemary. “I was thrilled,” Rosemary exclaimed and the energy from her voice was palpable. From that time forward, CPL dogs get to step away from the kennel for special weekends with Rosemary. This time is crucial to their training. It helps the dogs develop social skills in the home and gives them a chance to rest, play, and “reboot” for their coming week of training. Since then, Rosemary has gone on to be involved in almost every aspect of volunteer life at CPL. 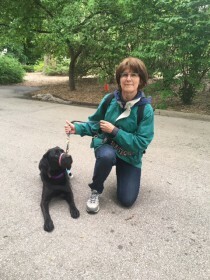 She has joined the socialization trips which take dogs in training out into public environments every Thursday, she’s helped and initiated many fundraising activities to benefit the organization, and she intends to do more. We at CPL, celebrate Rosemary and the hundreds of volunteers who bring our mission to life each and every day. We are proud to share Rosemary’s story with you.